Dickinson is a city in Stark County, North Dakota, United States. Get some historical perspective at South Unit and Patterson Lake Recreational Area. Discover out-of-the-way places like Peaceful Valley and Heart River Golf Course. 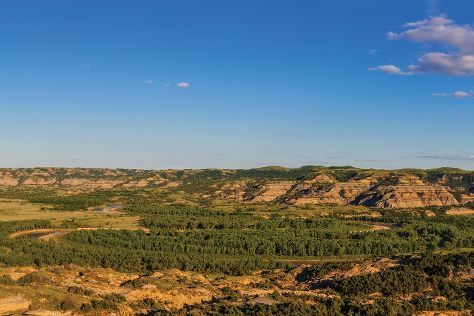 Explore the numerous day-trip ideas around Dickinson: Painted Canyon Overlook (in Theodore Roosevelt National Park) and Medora (Bully Pulpit Golf Course, Maah Daah Hey Trail, & more). Next up on the itinerary: examine the collection at Dickinson Museum Center. To see ratings, maps, photos, and tourist information, read Dickinson travel guide. Use the Route module to find suitable travel options from Lincoln to Dickinson. The time zone changes from Central Standard Time to Mountain Standard Time, which is usually a -1 hour difference. In July, Dickinson is a bit cooler than Lincoln - with highs of 84°F and lows of 56°F. Finish up your sightseeing early on the 22nd (Fri) so you can travel back home.